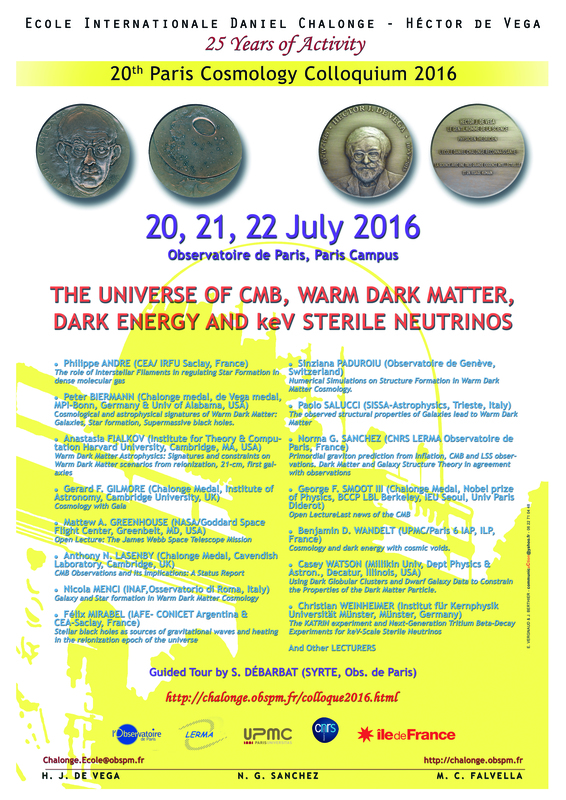 In the context of this new Dark Matter situation, which implies novelties in the astrophysical, cosmological, particle and nuclear physics context, the 20th Paris Colloquium 2016 is devoted to the Latest News from the Universe. 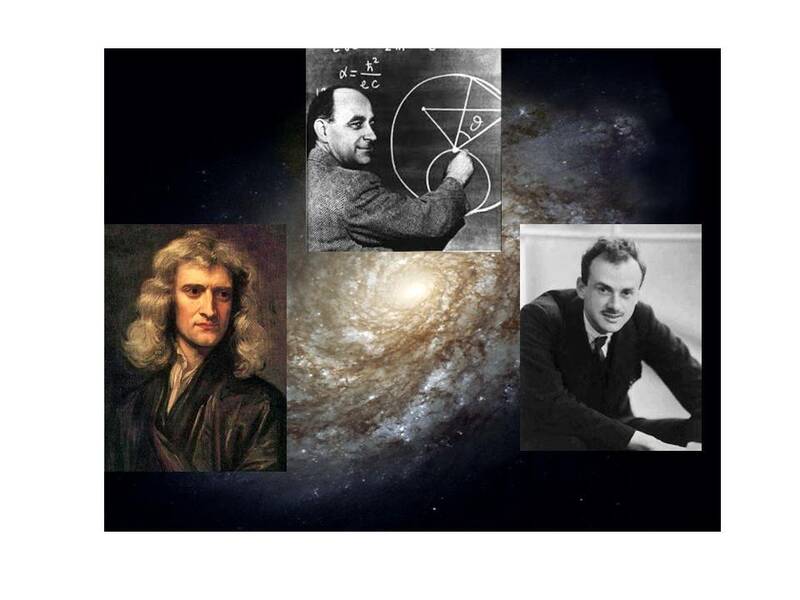 Cosmological and astrophysical signatures of Warm Dark Matter: Galaxies, Star formation, Supermassive black holes. Cosmology and dark energy with cosmic voids. Using Dark Globular Clusters and Dwarf Galaxy Data to Constrain the Properties of the Dark Matter Particle. [Lunch at the Observatory self-restaurant includes the following items: Entry/appetizer. Main course. French cheese or green salad. Dessert (cakes or fruits or yoghurt). Drink (wine, beer or mineral water or other soft drinks). Coffee or Tea . choices (meat, fish, chicken, vegetarian, with their garnitures)]. Certificates of participation will be delivered by the Secretariat upon request. Participants wishing to attend the Meeting should register in time, and in any case Before 20 June 2016 , by on line registration. Badges for all registered participants in the list will be available at the Registration from Wednesday 20 July 8:10 am. Lectures start on Wednesday 20 July at 9:00 am at “Salle du Cassini”. 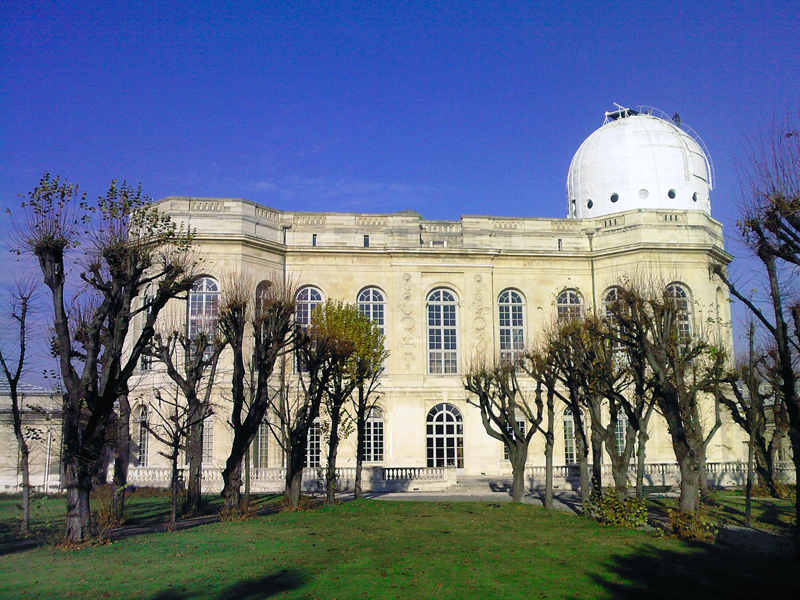 LUNCH is served at the Self-service Restaurant of Observatoire de Paris (located very near, inside the campus at Building B, ground floor). The PHOTO of the group will be taken on the meridian of Paris in the middle of the monumental south entry of the Perrault building on Thursday 21 July at the end of the afternoon session. A TOUR of Perrault building for all participants and accompanying persons will take place on Friday 22 July in the afternoon from 19:00 to 20:00, guided by Prof Suzanne DEBARBAT around a special subject and an exhibition choosen for the purpose). A COCKTAIL/RECEPTION for all participants and accompanying persons will be offered on Friday 22 July in the late afternoon (from 20:00) in “Salle du Conseil” (Council Room) and the terrasse aside (if weather allows it) in Perrault building along the Meridean of Paris. Lunch will be served at the Observatoire Self-Service Restaurant. It is located in the ground floor of building B ("Bâtiment B").